I am writing this post from a balcony high above Lago Maggiore, sipping fresh coffee and watching the sun come up on another clear, blue day. There’s no cycling to do today (sad face), but it is nice to have a quiet, relaxing morning after the past 16 days. Yesterday we set off from Gotthard campsite in Andermatt after spending the evening with Sue and Ben my aunt and cousin respectively. Everyone else had a long, cold night with not much sleep as this was our coldest camp of the trip. I definitely felt lucky (and a little smug) about my Alpkit Pipedeam 400 down sleeping bag with a silk liner which has served perfectly for everything from the hottest summer night in France to an (apparently) cold night in Andermatt. 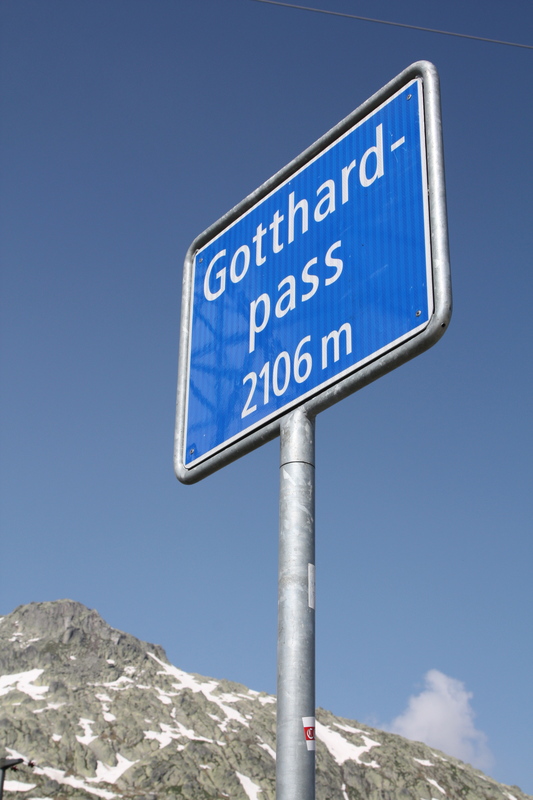 We have been very lucky with campsites over the past couple of weeks so we were due a duff one, so a word of warning: Gotthard Camping Andermatt is a small patch of grass with the facilities over the main road inside the cable car station. 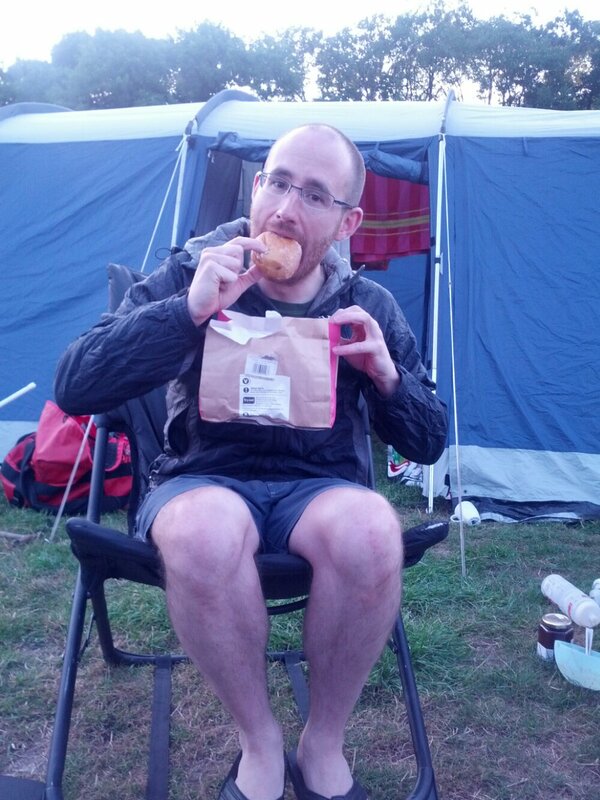 The campsite is a bit of an afterthought, but the facilities were at least clean. I would guess that it’s the only campsite in Andermatt because the lady running the place was pretty rude as well! Fortunately we only stay in campsites to sleep, so it was all soon forgotten as we got on the road. I think the mental and physical anguish from the previous day had worn everyone down because the start wasn’t the most efficient we’ve had. There’s something about setting off for the last day where you almost feel like it’s over so there’s no rush. 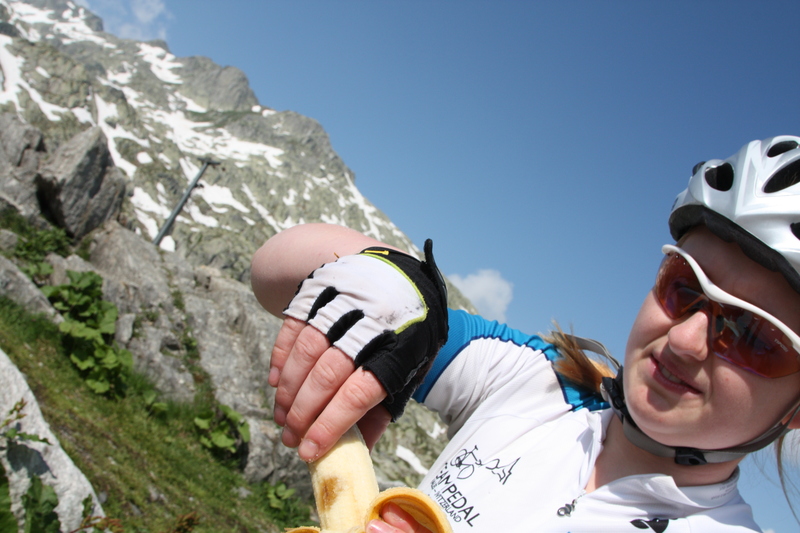 The climb for Gotthard starts a mile or so from the edge of Andermatt so I had a lighter breakfast (only 4 Weetabix!) and we just carried bananas and water. 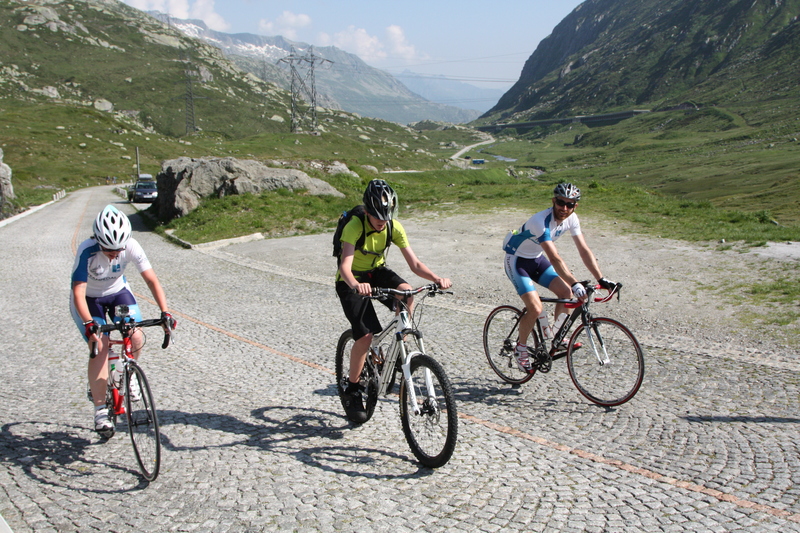 After yesterday’s ascents of Grimsel and Furka, Gotthard promised to be more straightforward, albeit with a cobbled section. 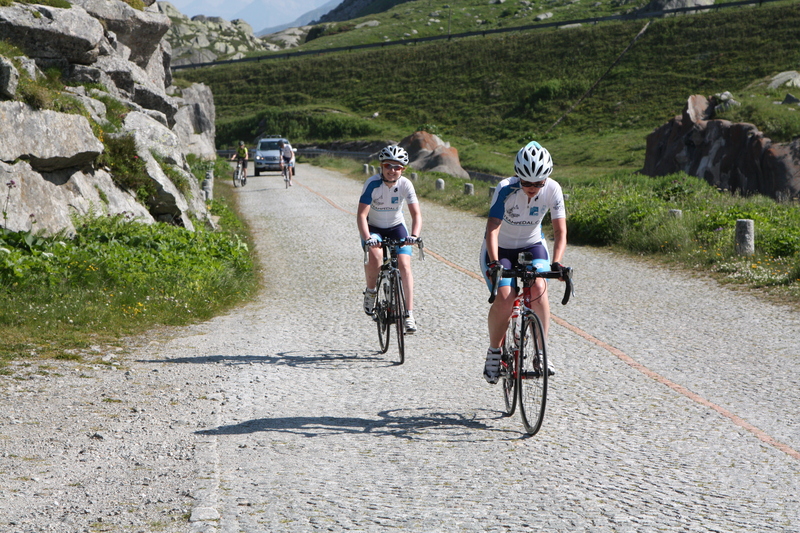 Jen’s knee had improved and she was feeling positive about the last climb, so we all pushed on together. 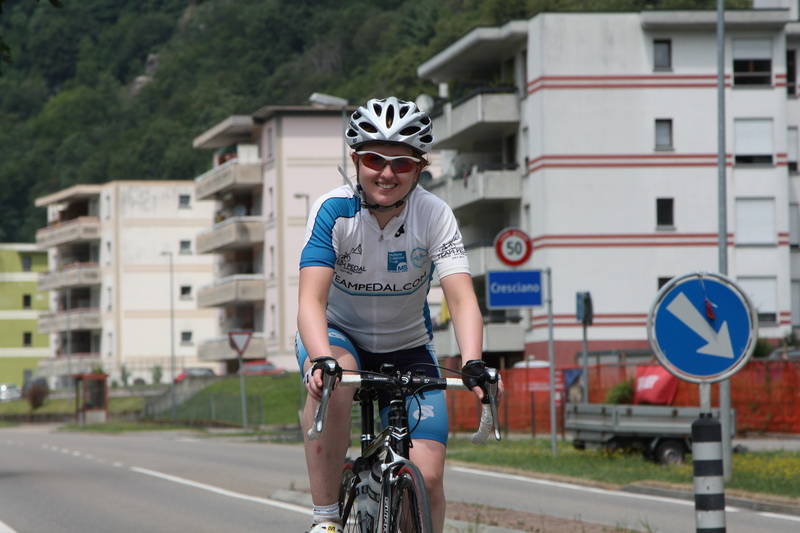 The photos show something of Jen’s determination, and I think her knee was somewhat more painful than she let on. 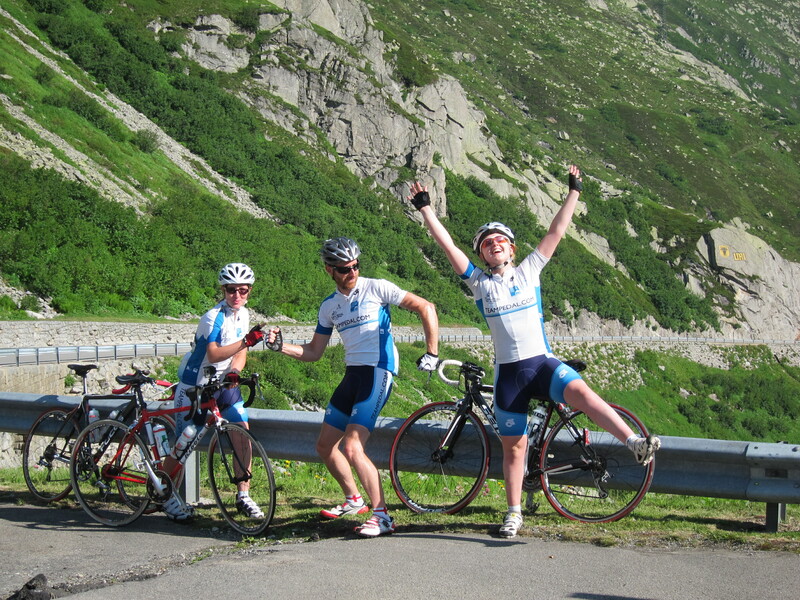 Near the top of the Gotthard pass we were joined by Ben, who climbed the last couple of hundred metres with us. I think he had a better time than us on the cobbles as he’s got a full-suspension mountain bike! 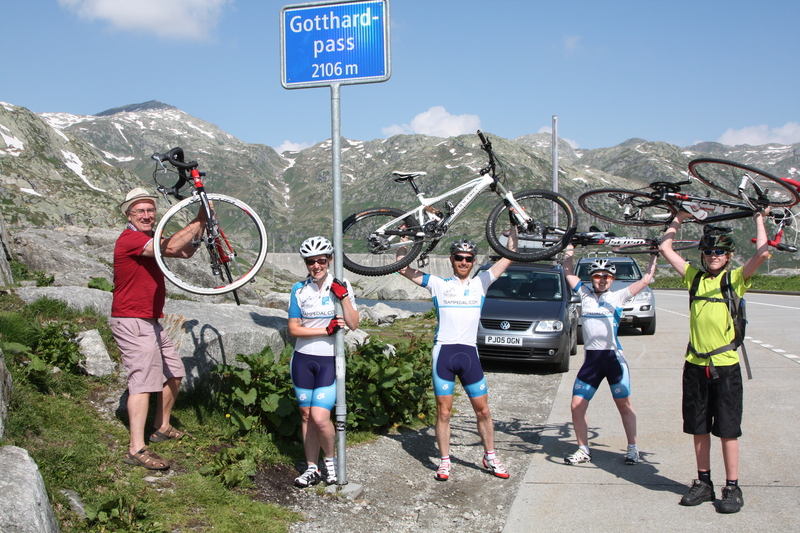 The Gotthard pass marked the end of the substantial climbs of the trip, but there was still over 50 miles to go to Locarno so we decided to stay on the main road as it wasn’t too busy. 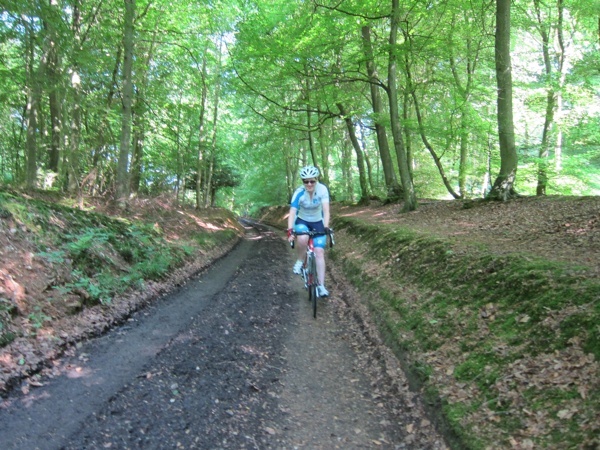 The cobbled path was fine for an ascent, but is a bit too jarring to descent at speed on a road bike. 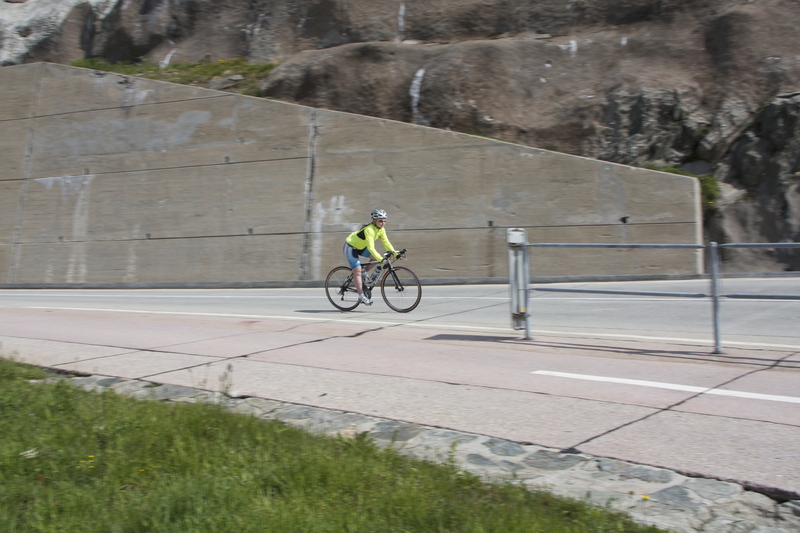 The only down-side to this decision was the 1.6km tunnel early on in the descent. It started as a gallery with an open side, but there is an extended section which is completely enclosed and it quickly became too dark for my sunglasses. Trying to hurtle through as quickly as possible so you aren’t constantly being overtaken is fine, but with nothing protecting my eyes I was soon streaming. 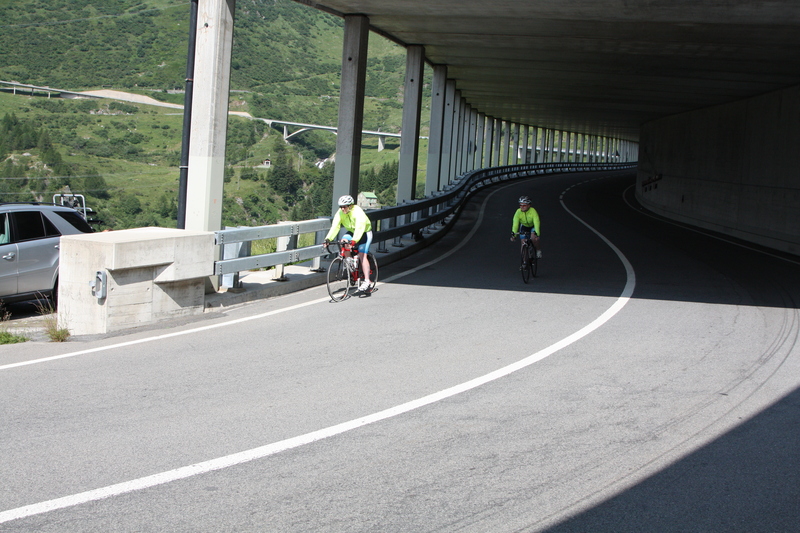 I didn’t see a way to avoid the tunnel but use the main road for the descent, but the remaining long straights and picturesque hairpins made our choice a good one. 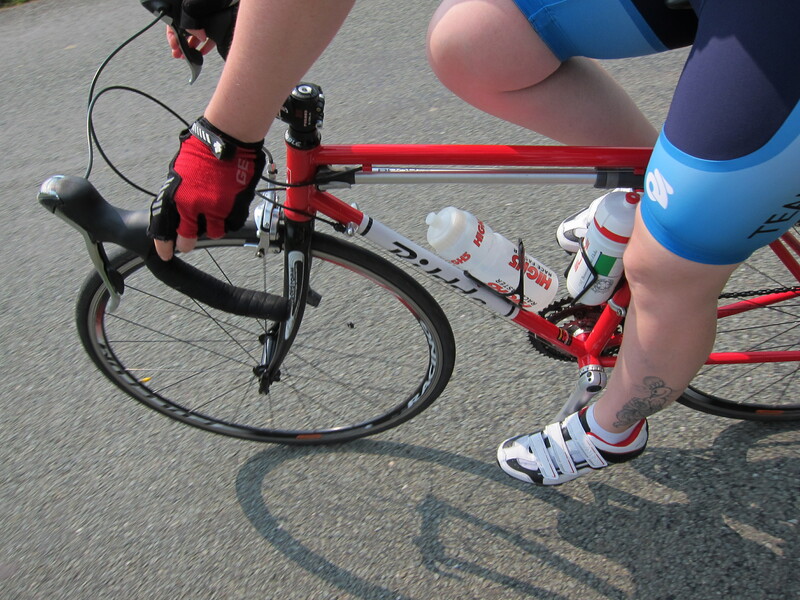 The road surface was generally excellent and allowed a safe build up of speed. I can’t tell Mum, but the GPS clocked over 50mph down one straight, which I think was the same time I was overtaken by a very shiny black Ferrari. It was a shame the GoPro’s battery died after the time-lapse recording of our ascent, because that descent was fun! 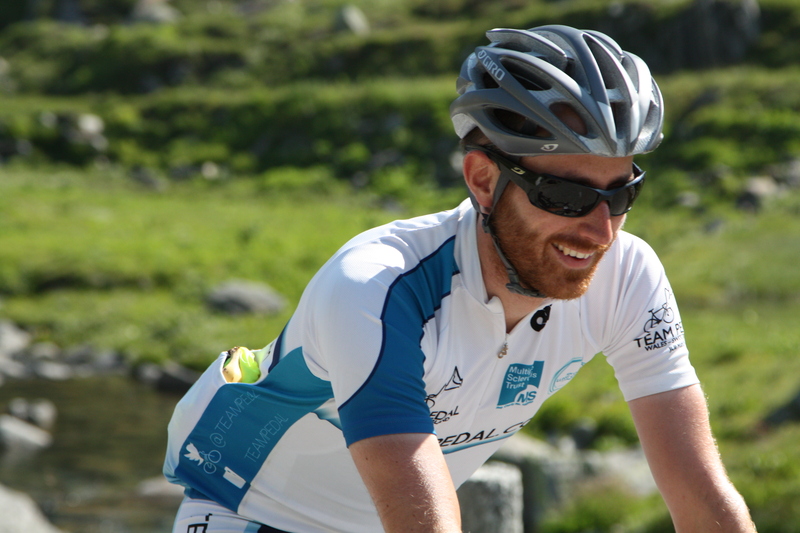 As we descended towards Airolo we started pausing with the support team more frequently, taking longer breaks, and generally just winding down. 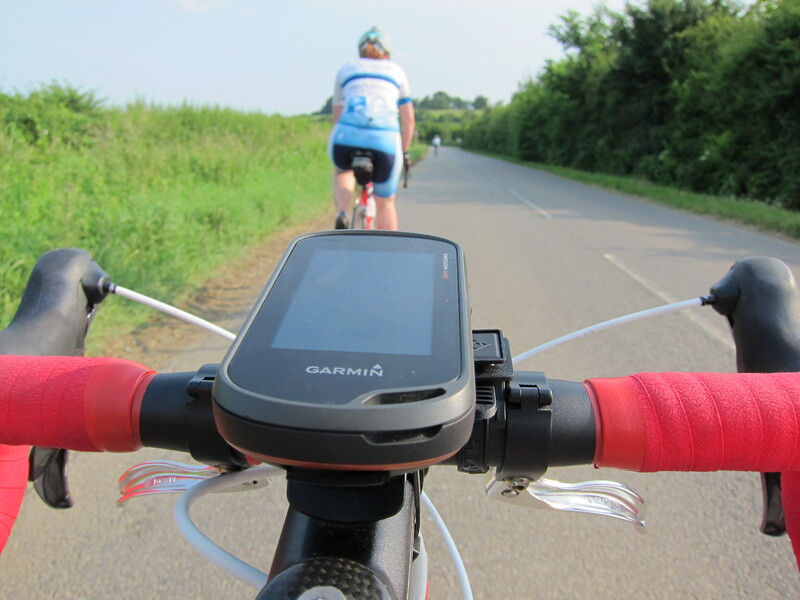 Glancing at the GPS showed we weren’t making as good progress as we needed so unfortunately we had to part company with Ben for a short while to get back up to road-bike speeds. Just before we did I swapped bikes with Ben thinking “this will be easy, I’ve been cycling for the past two weeks”, but keeping up with Jen, Meg and Ben on roadies with 1.75″ knobbly tyres and road shoes with cleats on big flat pedals was arduous work and I felt pretty tired when we swapped back – good effort for keeping up with us Ben! Give me drop handlebars any day for long rides. Riding towards Bellinzona the heat started to feel oppressive. There was a thick cover of cloud and it looked a lot like we were going to get wet before the end. The humidity was right up there and we were more accustomed to a nice dry heat. At one point Jen started feeling dizzy so we had to pause just to make sure noone passed out. That would not have been a good end to the trip! 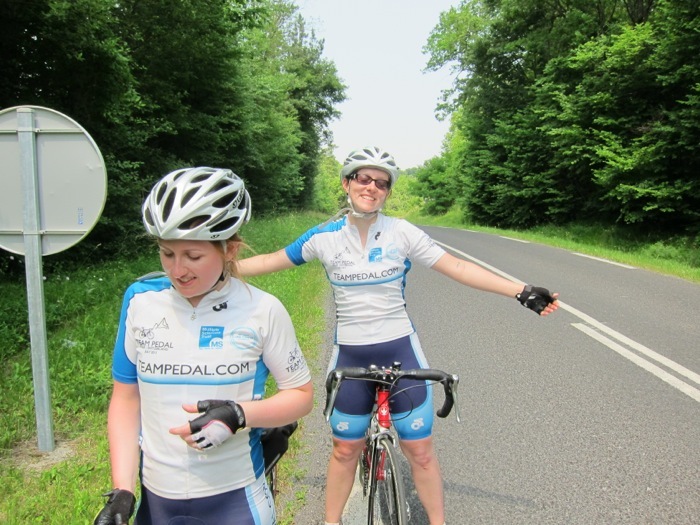 We were supposed to meet Ben and Sue in Bellinzona so Ben could ride the last section with us but we experienced the first technological failure of the trip: Megan’s phone died and ours were in the support vehicle. In the end we pushed on to Locarno but started feeling a little worried we were going to finish alone. The stretch between Bellinzona and Locarno had a little sting in the tail and there were plenty of short sharp inclines before we arrived by Lago Maggiore. As soon as we hit the lake it started setting in that we’d made it. Sue, Rico and Ben have been amazing and brought down Swiss flags and Union Jack bunting for us to cross the finish with. We must have looked pretty bizarre standing by the Locarno ferry terminal with cameras everywhere snapping away. There was time for a quick ice cream before I headed up the hill with Ben and jumped in the pool, with no intention of getting out before dinner. So, what next? We’ve got a few hours before we have to set off on the long drive home, which will take Dad and Chris to Oxford, Bangor, Leeds and the Isle of Wight. There are too many photos and videos to even think about today, so it’ll have to be the pool. What a shame. This post wouldn’t be complete without a huge thanks to everyone who’s helped us get here. Your donations have helped us raise over £2700 so far for the MS Trust and the Roy Castle Foundation, and the support we’ve received has really blown us away. Most nights we’ve been able to at least read the comments on the blog and Twitter, even if we weren’t able to reply to them, and knowing we had the support of everyone back home has done wonders for our morale and motivation. The only way to sign off this post is with the biggest thanks of all to Dad and Chris. They’ve given up two weeks of “holiday” to set up and dismantle the team tent, feed us, clean up around us, provide us with timely suncream, food and water, provide emergency support when Jen’s knee has been at its worst, and everything else. Every day they were up before us and were working well after we’d arrived back in camp and got sorted out. Without their hard work and continued good humour there’s no way this trip could have succeeded, and running support is often a thankless task (we know we can be pretty demanding!). 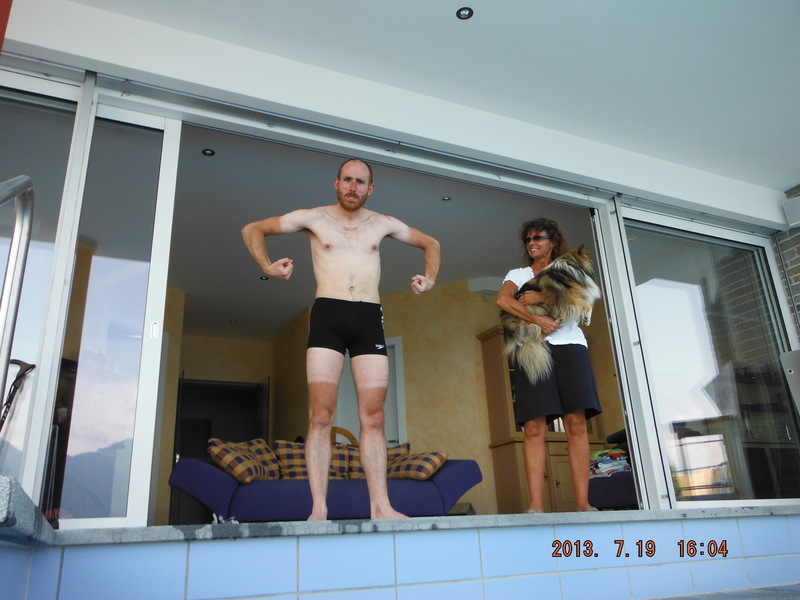 Winner of Best Tan Lines Ever is…. A relativley short and sweet post from Megan for now. We finished the day on a snappy 82 miles in roughly 7 hours. Today has been really quite fun in comparison to the previous hard, long days. 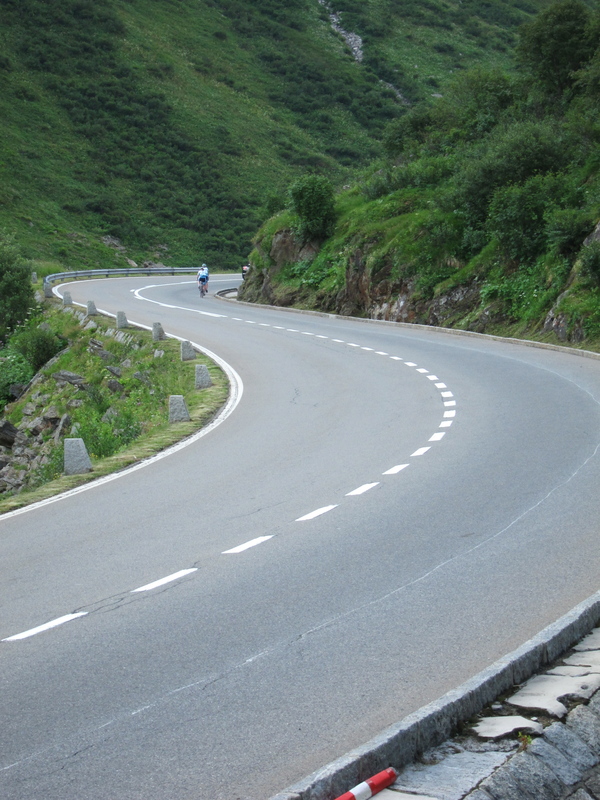 We had some incredibly fun long sweeping descents on some really smooth roads. Long flat straights and fast downhill runs meant that we had a very good average pace this morning of about 13mph. 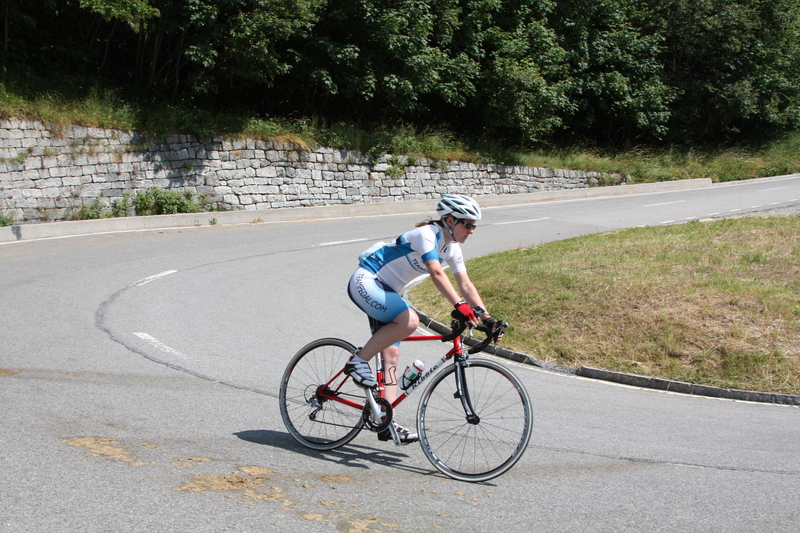 There were a couple of hills thrown in for good measure, and Jen’s knee has behaved itself today, so all in all a very well deserved good day with positive results. 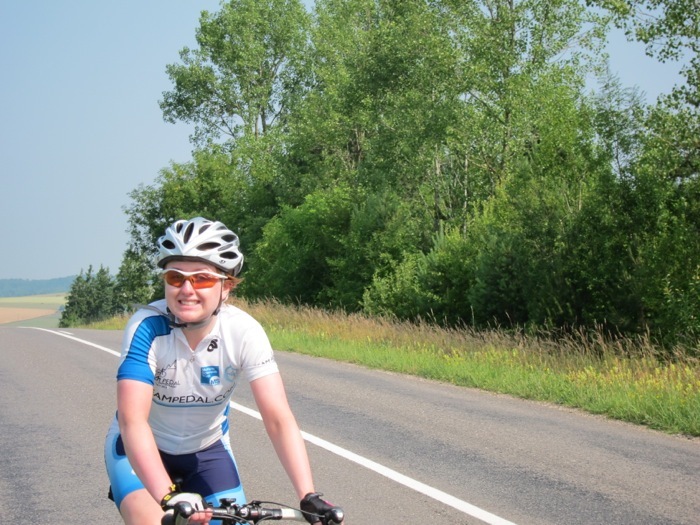 The fast day meant that we got to meet our wonderful support team , Dad and Uncle Chris, at a rough 3/4 point for some quick snacks and suncream replenishment, and then we set off to finish the last 30 miles of the day. We finished the day at roughly 4pm so we’ve had a lovely long afternoon and evening to rest, relax and recuperate in preparation for a VERY big day tomorrow. So foods prepared, stretching sessions have been carried out and everything is ready for our start tomorrow morning . 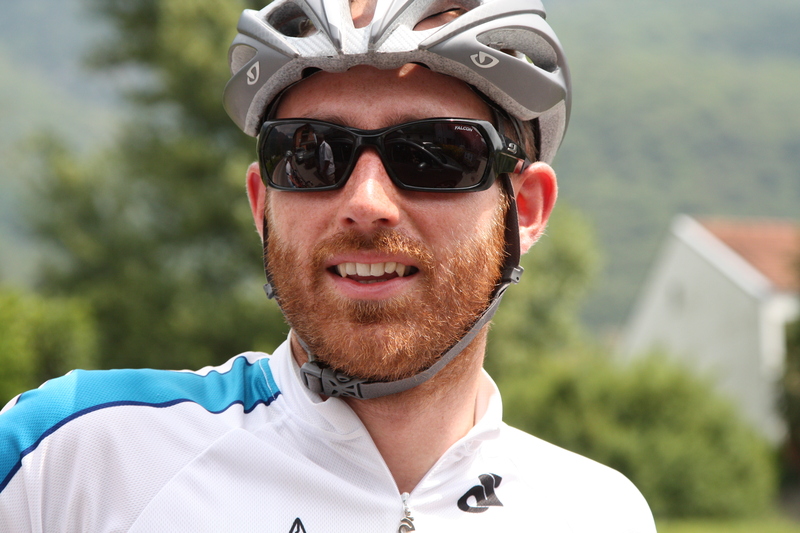 Hoping to set out at 8am for a 83 mile day that consists of 60 miles of undulating hills over the French countryside, and we will be finishing the day on a very challenging note, by climbing the Route De Ballons / Ballons de Voges. This particular route is 1,000 metres of ascent over a distance of 10km . Ryan, obviously could eat this for breakfast, Jen is nursing her bad knee but is ever optimistic and I, Megan, am quite apprehensive, but excited all the same. Of course, as hard and as challenging as tomorrow may be , it will be peanuts compared to the three alpine passes that are coming our way in the next few days . All in good fun !!! This is what all the high resitance and hill training has been about ! come at me !! PS Here are just a few snaps for you to enjoy !! 😀 Sorry theyre not captioned and categorised , but im a very tired monkey and need to sleep ! After a half day of rest we went to bed as early as we could to make sure we were refreshed for the day ahead. 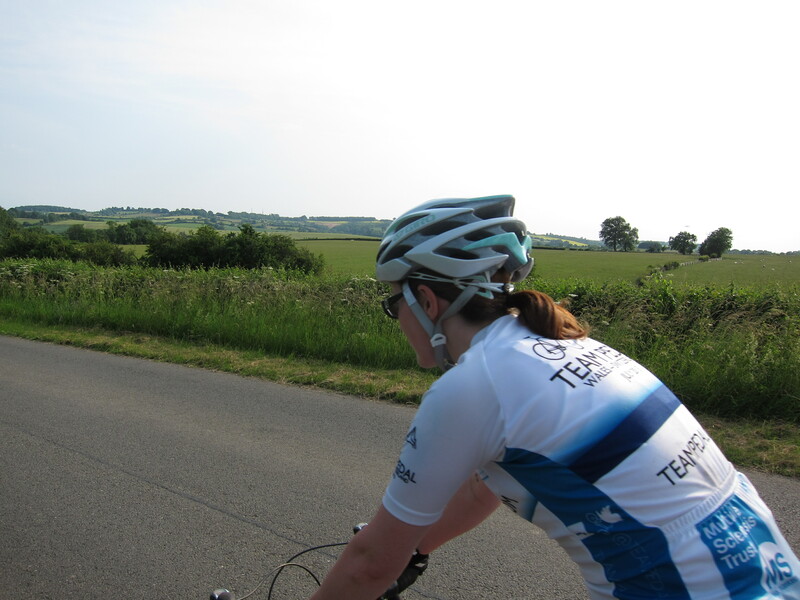 A quick look at the weather forecast told us it was set to be the hottest day of the year so far, so we wanted to set off early to get a good proportion of our cycling done before the high temperatures started. 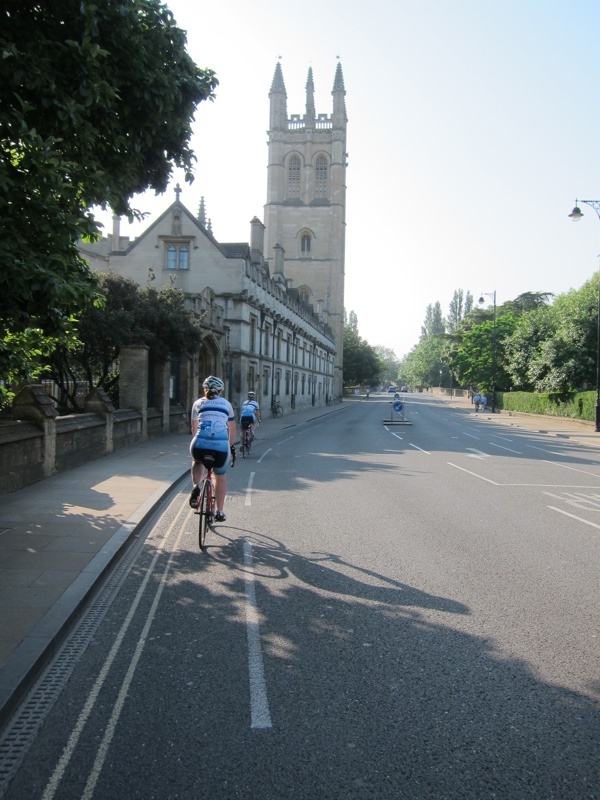 As we set off from Oxford at 7.30am I was a little apprehensive about my knee as it still hurt a bit, but we took it slowly as we warmed up. 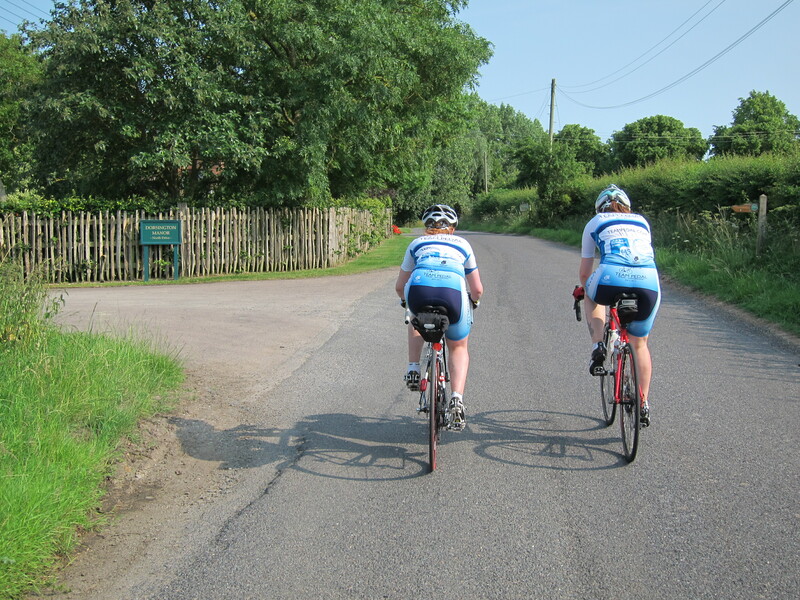 Before too long we were zooming down to Henley, with very little knee pain, and making excellent progress. Today has really showed us how wonderful our support team is and how much we rely on them. We are so grateful for Chris and Richard, for setting up camp, cooking us dinner, driving all over the country after us to supply top ups of suncream and flapjack. We couldn’t do this without them! 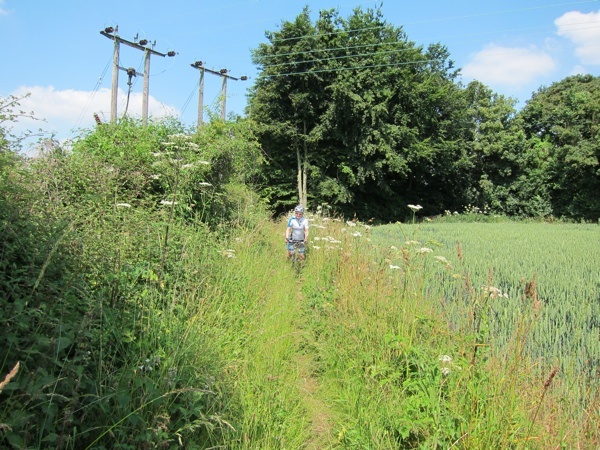 There were a few unexpected moments on today’s route, not least the two off road mountain biking moments…. thanks GPS for assuming all bike routes are equally suitable! Cycle Route? Path? Field? It’s hard to tell! As the day wore on we did get a bit slower, thanks to my knee which had its occasional momenta of pain. I’m just glad it wasn’t all day pain like yesterday, at least I had some relief for the occasional 20 minutes. We made it to Lower Beeding, near Horsham which completed our 87 miles for the day. As the campsite we’re staying in is away from the route we didn’t need to cycle all the way there, so Richard picked us up and that was us done for the day. We’re staying in the brilliant Blacklands campsite, which not only has fantastic facilities, but the lovely owner Keith, hearing of our ridiculous adventure, has made a donation to our charities, thank you! So now everyone is busy running around preparing everything for tomorrows trip. We’ve planned a 76 mile route which will take us to Folkestone and our UK stint will be done. Team Pedal Day 3 and we set off early to be driven back to yesterday’s finishing point in Ilmington to cover the remaining miles back to Oxford. There is something mildly unsettling about being driven away from somewhere you then need to cycle back towards, but that is something we have to face up to on this journey, as we may not always be able to cycle to our destination every day. Today the plan was to continue through Oxford and head towards Guildford but my knee had other plans. After a painful day yesterday when I started getting knee pain towards the end of the day, I had hoped a good nights rest would solve it. Unfortunately not as today’s 35 miles were excruciating. This early in the trip we need to make the most of the additional days we have set aside for rest. Whilst our bodies are adjusting to the sudden onslaught we’re putting on them, rest days during this time can be very beneficial for us all. So we made it back to Oxford after making the Team decision to rest for the afternoon. It’s important for us to always keep the bigger picture in mind. We have to make it all the way to Switzerland, so it makes little sense to push through injury and potentially make it worse. If I pushed myself through injury and couldn’t even make it across France I would be very disappointed. 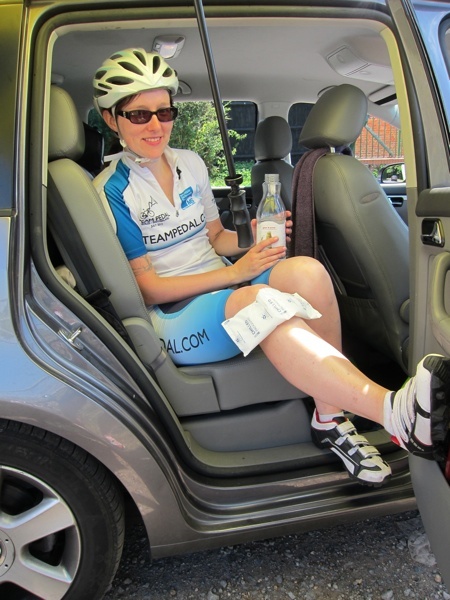 Currently my knee is drugged up, bandaged up, raised up and iced up – all this will hopefully make it better tomorrow and ready to do the next 80 miles. We’re all optimistic that our afternoon of rest will refresh us all and allow the Team to push on further. The last two days have been very hard, but we’re all still determined and committed, spurred on by the great support we’re receiving from everyone. 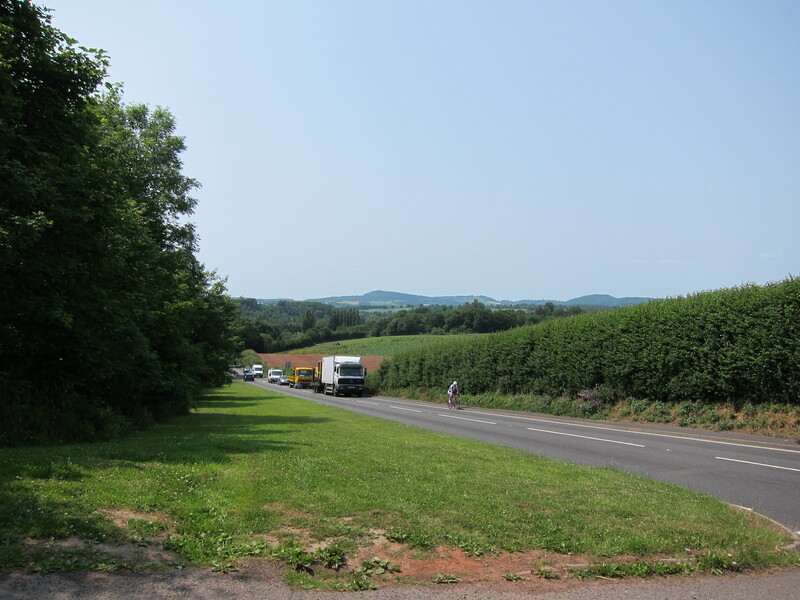 Day 2; Shrewsbury to Ilmington. So today , after adjusting to morning-campsite life, we set off cycling a little late. We got half way out of the campsite down a hill when I (Meg) found that one of my brakes was squealing alarmingly, i turned around to have them checked out. initial hiccup out of the way we had a few steep hills for breakfast. 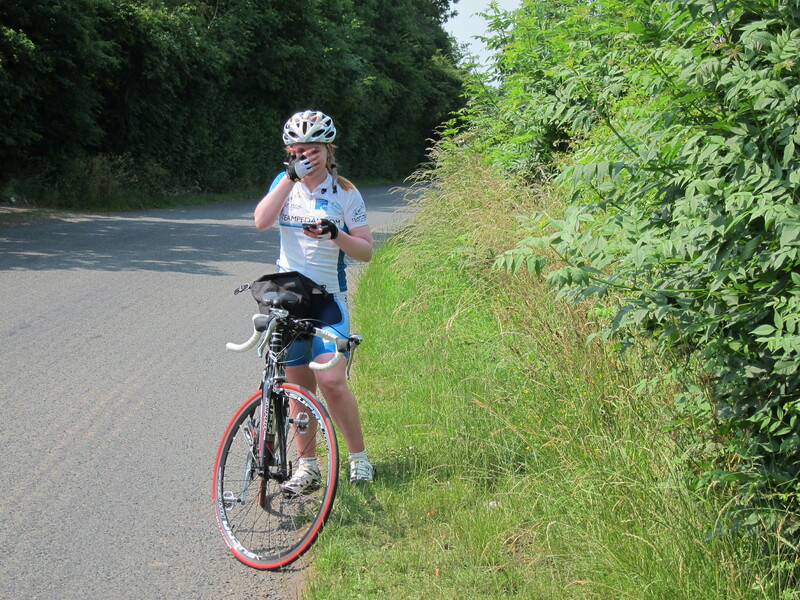 After a particularly long hill with a cheeky 14% incline popped into it, we had thoroughly woken up . The scenery has been beautiful today, its fair to say the rolling green hills and quaint towns of Shropshire are stunning to cycle through. England has actually blessed us with glorious summery weather with the sun has been beating down on us. It’s lovely weather and we couldn’t ask for better riding conditions however we welcomed the shade on our several pit stops. 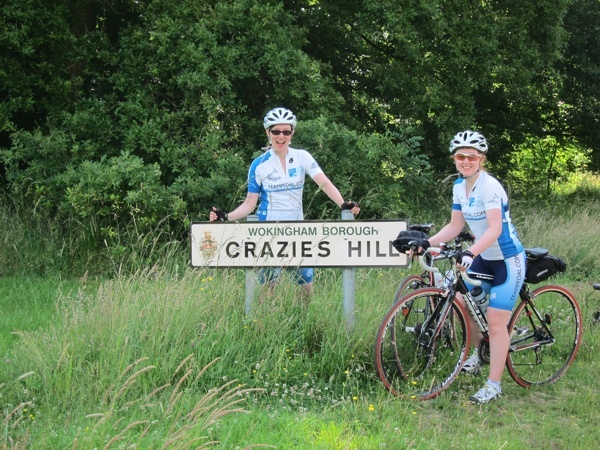 We cycled 75 miles today, nearing about a third of the way of the U.K chunk of our adventure. 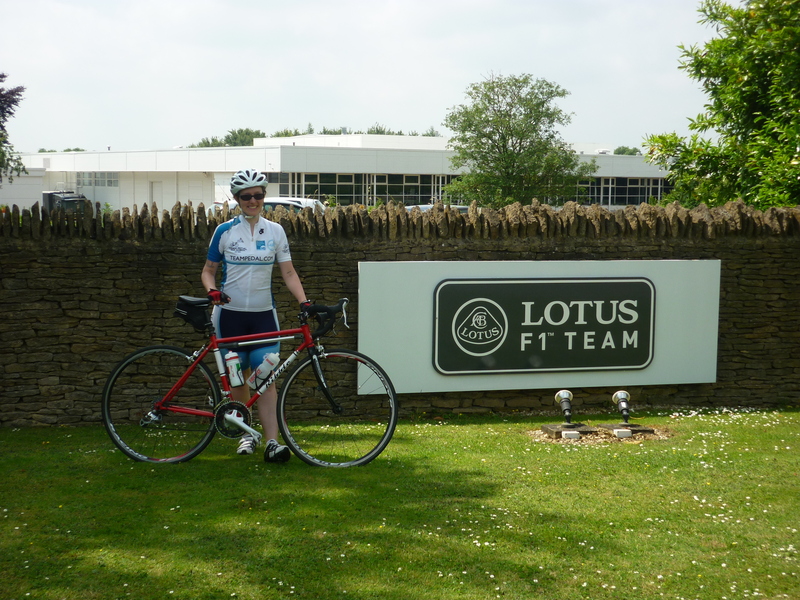 We then drove a further 30 miles to stay at Jen’s house in Oxford. We will be returning to Ilmington bright and early to set off from there tomorrow. So what with Ryan’s puncture yesterday and Jen’s today..I guess tomorrow will be my turn. Let’ hope i avoid any deep potholes! My brain is now gradually turning off considering that we’ve been up since 7.30am, cycled 75 miles and eaten a portion of pasta suitable for a small family. So I may mention a few things, and post a few photos, but no coherent sentences from now. -we have passed 4 dead badgers on our travels, it’s very sad. -we entered a sliproad onto a dual carriageway before realising the mistake, that was interesting. 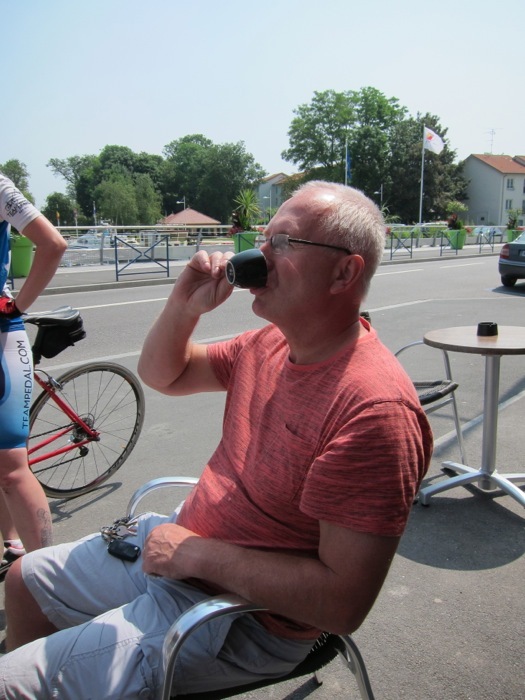 -I have an uncanny knack for getting my kit covered in suncream and dead flies, and also my right calf gets covered in bike grease from the chain. Thus I am lovingly known as the scruffy one of the team. Let’s hope that I can try to look slightly cooler when arriving in Switzerland. Until tomorrow, here’s some pics from today. And tomorrow’s post will be done by Either Ryan or Jen so you wont have to read me rambling again ! There will also be a video posted tomorrow for your entertainment. So it’s the end of day one . 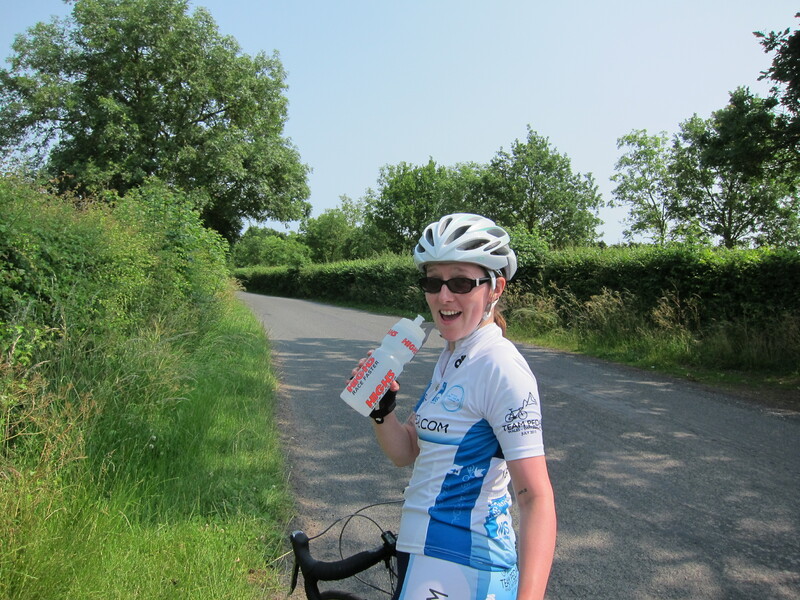 90 miles done from Bangor in North Wales to Shrewsbury in Shropshire. We are currently sat around camp discussing tomorrow’s route and checking over the bikes . We were very lucky with the weather today, aside from setting off in gloomy rain and strong winds this morning. It started out a bit minging, and having not cycled in a whole week , the first hills were a little tough with the wind and rain to slow us down. We headed down the A5 through Betws -y-coed and Pentrefoelas before reaching Whittington . Apologies .. 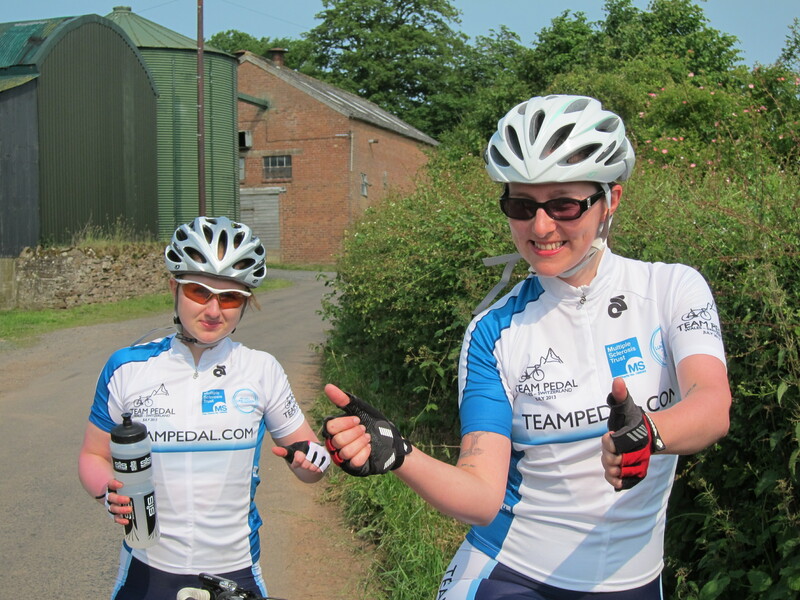 But hectic evening , settling into daily team pedal life has taken its toll. We’re all tented up and heading to sleep 10pm! Blogging will be more interesting , thorough and overall better in the days to come . We’re all well. Optimistic and excited for the ride to Oxford tomorrow !